California, 1945, and Lieutenant Peter Duluth is on leave from his ship, looking to spend some time with his wife, Iris. Given that she has seemingly accidentally become a major movie star, and peace and quiet is hard to come by, they accept an invitation from Lorraine Pleygel to join their house party on the shores of Lake Tahoe in Nevada. Among the guest are three female friends of Lorraine, all of which are currently undergoing marital troubles, being separated from their spouses. But unfortunately Lorraine has the clever idea to invite said husbands along to, in order to patch things up. So the Countdown begins to Review 1000, and as I mentioned before, the plan is this – ten books from authors that I’ve not reviewed before but that I really should have. 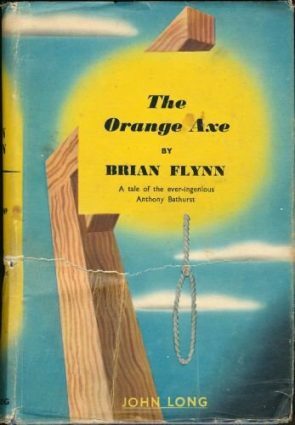 I decided to stick to Golden Age authors – their names and the book titles are all hidden in the image below, where I’ve highlighted this one for those readers out there who didn’t work it out last time I posted it. 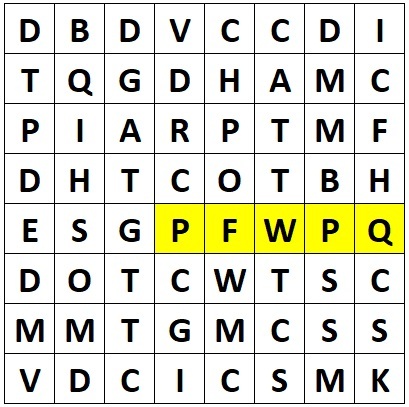 So we’re beginning with this one – Puzzle For Wantons aka (brace yourself) Slay The Loose Ladies by Patrick Quentin. I’d seen the name a few times recently amongst the Golden Age online community and figured this was a prime candidate. As far as I understand it, Patrick Quentin was a writing team (at this point in time at least) consisting of Richard Webb and Hugh Wheeler, and they (although just Wheeler after 1952) produced seventeen Peter Duluth mysteries, of which this is the fourth. I say it’s a Peter Duluth mystery, but Peter and Iris are clearly a team and while the reader’s attention is focussed on Peter, Iris does a lot more of the work here. All the better for it, as several characters have a habit of banging on about how useless women can be – and the title is massively inappropriate too, while we’re at it – and how they shouldn’t be trusted, so it’s nice to see at least one of them recant at the end of the tale. And what a tale this one is. A great start to my Countdown, and it’s clear to me that Patrick Quentin aka Q Patrick aka Jonathan Stagge is someone who I need to look out for. A large cast of characters still remain distinctive without lapsing into caricature and there’s a nice line in dark humour threaded throughout the tale – the threat of menace hangs over the entire cast as it looks at some point that it’s turning into Ten Little you-know-whats. Although one has to question why, after the second “accidental” death that the house party is still going on. But the killer’s plan does have some clever logic to it and I think it’s reasonably well-clued too. The central idea is complex but not unfollowably so, and the murderer is, I think, pretty well hidden. Certainly hidden well enough for one central character to miss the point more than once. So, this is a bit of a cracker and well worth your time. Probably the most enjoyable mystery that I’ve read in a long time and a definite Book of the Month contender. Highly Recommended. Exciting that the great count down has begun! Glad you enjoyed your first Quentin experience well, as I definitely enjoyed mine last month with The Wife of Sheldon. Interesting to read that Iris plays a big part in this book as she didn’t really feature very much in the story I read. Glad to hear you enjoyed this one, but boggled to learn that GAD experts like you and Kate (until recently) hadn’t read any PQ before. I’d rate him/them in the Top Ten, easily, possibly in the Top Five. It’s a very long time since I read the books — as nice Gollancz Yellowjackets, back in the day — but I recall that Wantons isn’t even one of the better ones! I’m planning a PQ reading/rereading binge at some point, when I get there . . .
Really? Well I’m looking forward to more then. I used to own a few of the Green Penguin versions, but alas sold them off before I moved to the US. Pan also reprinted some of the PQ novels, as I recall. I have never read PQ or QP or JS. I am glad this one is good. They were reissued recently, but are pricey. I was thinking pricey on Kindle! I am finding readable copies of GAD harder and harder to come by. I have seen Puzzle for Fools a few times in a nice Penguin edition. Symons was a fan so they appeared when he was in charge I think. I can get the first few in another e form from the library, so might start Wantons this week. 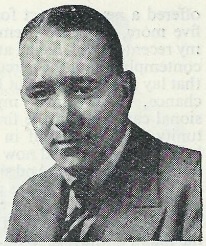 Hugh Wheeler later wrote the books for several hit Broadway musicals, winning Tony awards to go with his Edgar. Thereb are 9 books in which the pair Peter and Iris are present though in their final appearance in The Wife Of Ronald Sheldson they serve as subsidiary characters along with Inspector Trant. A distinguishing feature of this series is that Peter and Iris are present not merely to investigate murder. The plots actuallyrevolve around crucial events in their own lives. For example , there is a break-up of their marriage in one book and eventual repair in the next. 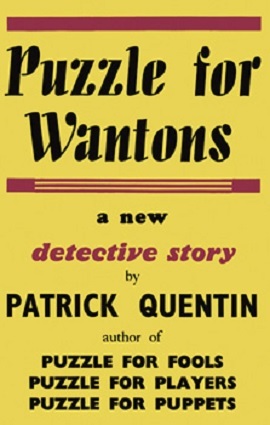 The later Patrick Quentins (written by Hugh Wheeler alone rather than in partnership with Richard Webb) are much better – in terms of plotting, craftsmanship and depth – than the earlier ‘Puzzle’ books, in fact they’re as good as Crime Fiction gets, but the Puzzle books are still good and nicely varied in style and mood. There’s also the recently published collection of ‘The Puzzles of Peter Duluth’ containing a fun & charming selection of short stories and novellas. Thanks for the info. If they get better than this one, then I’m in for a treat. I’ll keep an eye out for the collection. When I was just a tad, the six Puzzle were reissued by Signet, I think, and as Santosh alluded above, they chronicled Peter and Iris’ rocky relationship as much as they satisfied as mysteries. 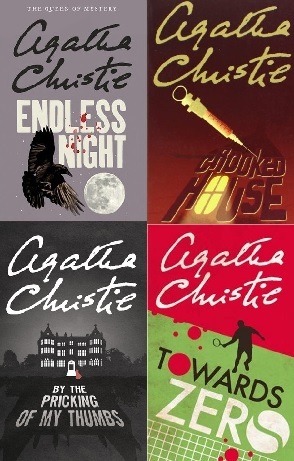 I plan to re-read them, as well as explore Quentin/Stagge/Patrick. I think you have much pleasure ahead, PD, and that Patrick Quentin might figure prominently in your next thousand reviews! It seems great, I’ve read your reviews and I just buy the french omnibus “7 puzzles” at a bargain price (4,50 euros) i’ll read it soon. 7 Puzzles? Mais la couverture du livre montre 8 titres: Puzzle pour fous, Puzzle pour acteurs, Puzzle pour marionnettes, Puzzle à Reno, Puzzle pour démons, Puzzle au Mexique, Puzzle de mort, C’est ma faute ! This is a slight but engaging bit of GAD, from 1933. It’s told in epistolary form, unsent letters from a young woman. Why unsent? Because she is on a cruise so the notes are in a journal. All the murders take place at sea, during the voyage. There is a cute form of a challenge to the reader, the reader challenged being her fiancé to whom the letters are addressed! I think the kind of people who hang out here would like it. There is nothing outstanding in the plot but the writing is better than average, and it moves along. 185 pages, $3 US Kindle.